French luxury marquee, Bugatti will be introducing the “Les Légendes de Bugatti”, an exclusive special edition of the Veyron 16.4 Grand Sport Vitesse that pays homage to six heroes of their successful history at the Monterey Auto Week in California next month. The first Legend is dedicated to Jean-Pierre Wimille, who garnered two victories for Bugatti at Le Mans. It honors the driver who triumphed at 24 Hours of Le Mans for Bugatti in 1937 co-driving a 57G Tank with Robert Benoist. He also won in 1939 while co-driving a 57C Tank with Pierre Veyron. Taking inspiration from the 57G from 1937 Le Mans, this Grand Vitesse has a blue clear-coated carbon fibre and a light Wimille Bleu paintwork finish. The interior references the essential characteristics of the classic models driven by those figures and to whom the edition pays homage. 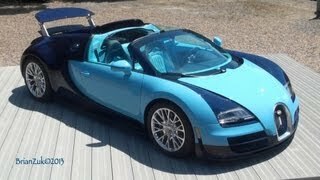 The Bugatti Veyron 16.4 Grand Sport Vitesse is officially the fastest series roadster in the world since achieving 408.84 km/h (205.04 mph). It is powered by an eight-litre W16 engine delivering 1,200 PS and a torque of 1,500 Nm (at 3,000 - 5,000 rpm), and accelerates from 0 to 100 km/h in a lightening 2.6 seconds. 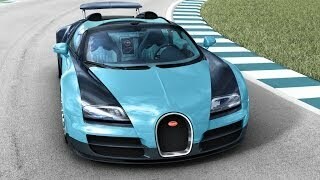 The production run for the Bugatti Legend "Jean-Pierre Wimille" will be limited to three vehicles. Pricing has not been disclosed yet.